This book examines the complex practice of counter-insurgency warfare through the prism of British military experiences in the post-war era and endeavours to unpack their performance. During the twentieth century counter-insurgency assumed the status of one of the British military’s fortes. A wealth of asymmetric warfare experience was accumulated after the Second World War as the small wars of decolonisation offered the army of a fading imperial power many opportunities to deploy against an irregular enemy. However, this quantity of experience does not translate into quality. This book argues that the British, far from being exemplars of counter-insurgency, have in fact consistently proved to be slow learners in counter-insurgency warfare. This book presents an analysis of the most significant British counter-insurgency campaigns of the past 60 years: Malaya (1948-60), Kenya (1952-60), South Arabia (1962-67), the first decade of the Northern Irish ‘Troubles’ (1969-79), and the recent British counter-insurgency campaign in southern Iraq (2003-09). Colonial history is used to contextualise the contemporary performance in Iraq and undermine the commonly held confidence in British counter-insurgency. 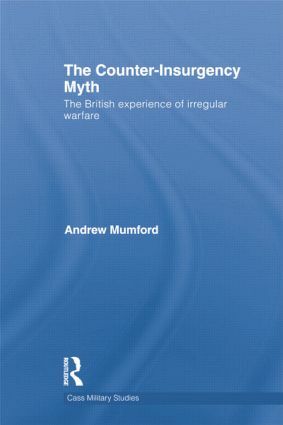 Blending historical research with critical analysis, this book seeks to establish a new paradigm through which to interpret and analyse the British approach to counter-insurgency, as well as considering the mythology of inherent British competence in the realm of irregular warfare. It will be of interest to students of counter-insurgency, military history, strategic studies, security studies, and IR in general. Andrew Mumford as of September 2011, will be a Lecturer in Politics and International Relations at the University of Nottingham. He has previously taught at the Universities of Sheffield and Hull. He is the founding convenor of the British International Studies Association (BISA) Insurgencies and Small Wars working group, and is the Book Review Editor of the journal Civil Wars.